Biological control is a component of a sustainable integrated pest management strategy. 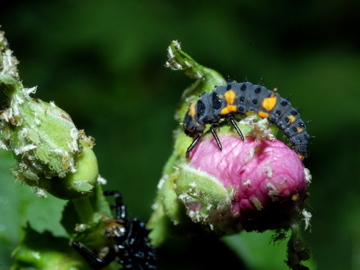 This alligator-like ladybug larva is a voracious predator primarily feeding on aphids. The project has two goals: (1) To ensure the sustainability of three high-value tree crops (apple, pear, and walnut) in the western US; and (2) to synthesize new information developed by this project with the existing knowledge base, and deliver it in a user-accessible package. This project is a response to stakeholder-identified needs for solutions to FQPA-mandated reductions in organophosphate pesticide use, which has destabilized IPM systems in use for decades in all three crops. This project is funded through the USDA-NIFRA Specialty Crops Research Initiative (SCRI) (grant#2008-04854) with matching support from Washington State University, Oregon State University, University of California at Berkeley, Washington Tree Fruit Research Commission, Washington State Commission on Pesticide Registration, Washington State University Pest Management Transition Project, and the California Walnut Board. Our project consults with an advisory group drawn from industry members, extension and the scientific community to ensure adherence to the project objectives. In addition to annual group meetings, investigators regularly consult with the people from this oversight panel. Mike Devencenzi Agricultural Consultants Mike is a pest control advisor heavily involved with walnut growers in the San Joaquin production area. Carolyn Pickel UC IPM Carolyn, recently retired, was the Associate Director for Agricultural IPM and IPM Advisor for the Sacramento Valley. Dr. Lucia Varela UC IPM Lucia is an Area IPM Advisor for UC Cooperative Extension, Sonoma County. Joseph Grant UC Farm Advisor Joe is a UC Davis Cooperative Extension Farm Advisor for San Joaquin County. He specializes in walnuts, cherries, olives, misc. fruits and integrated pest managment. Dr. Pete Goodell UC IPM Pete is the new Assoc. Director for Agricultural IPM and a UC IPM Advisor with statewide responsibilities. Dr. Tunyalee Martin UC IPM Tunyalee is UC IPM’s content development supervisor. She manages the team that develops the IPM manuals, Pest Management Guidelines, and other web site content. Jed Walton private PCA Jed is a private pest control advisor working with walnut and prune growers in the Sacramento Valley. Dr. Marshall Johnson UC Riverside Marshall is an expert in biological control and is responsible for tree crop extension in the San Joaquin Valley (outside scientist). Rich Garvin Cascade Crop Care Rich is an independent crop consultant with an interest in pear and apple IPM in the Hood River area. Bruce Decker Wilbur-Ellis Bruce is an IPM consultant who has been an active participant in outreach to growers. Dr. Jeff Olsen OSU Extension Jeff is the Extension Horticulturalist for the counties in the northern part of the Willamette Valley, the area with most of the hazel nut orchards. His expertise covers all the horticultural crops grown in the area, including walnuts, chestnuts, cherries, pip fruit and nursery crops. He is also involved in U.S. and international horticultural extension organizations. Nick Stephens Columbia IPM Nick is a private pest control consultant with apple, pear, and cherry clients and heavily involved with industry education programs. He also sits on the pest management panel from the Washington Tree Fruit Research Commission. Dan Flick Wilbur-Ellis Dan has been a pest control consultant in Washington State for 33 years. He is currently a commissioner on the Washington Tree Fruit Research Commission and head of the pest management research panel. Karen Lewis WSU Extension Karen works with the tree fruit industry in a range of applications and is currently the head of the WSU Fruit Extension Team. Dr. Doug Walsh WSU Entomology Doug is IPM coordinator for Washington State and has experience in a broad range of crops, including tree crops (outside scientist). Dr. Gary Judd Agri. Canada Gary is a researcher with Agri-Food Canada at the Pacific Agri-Food Research Centre in Summland BC, Canada. His function on this project is an outside science advisor specializing in IPM and Biological Control in orchard ecosystems.